Saving money on dinner! This is one of the 7$ winners! I made a dinner last night for the family that was a new recipe total win! Ace loved it. The kids almost licked the serving tray...I'm calling it a complete and total dinner success. The best part...it was freakin' fast. Not just regular fast...but freakin' fast. It would be nice enough to serve at a dinner party. Pretty enough to show to someone you actually *like*. 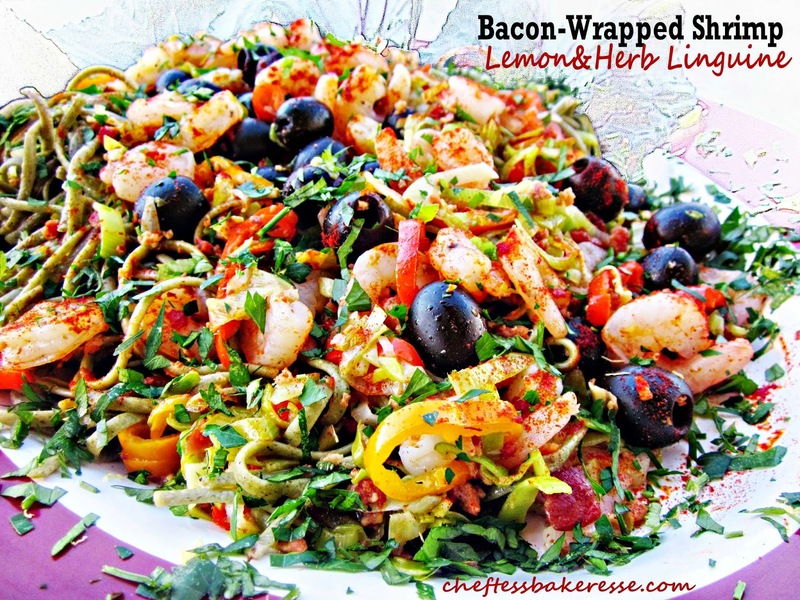 When asking my kids what I should call this new recipe of mine, Little Man took one look at the bacon and said, "Bacon wrapped shrimp blah-what-ever-is good-with-bacon wrapped-stuff" (That's 15 year old boy code...for "DUDE mom there's bacon in here...whatever you call it I'll eat it!). Thank you Gena for all the "Bacon Wrapped Friday Night" parties. He's now got that fact in his grey-matter for life. Question. Do I tell him I used the pre-cooked lean bacon coupled with extra-virgin olive oil like a responsible heart loving person? Yeah, I actually did. I totally want him to learn some healthier habits. Don't underestimate the power of the mighty leeks either. They pack this dish with .Magnificent. Flavor. If I can be so bold as to say so. You would be amiss to leave them out. Be sure to wash them well and dry well too. First grab one of the leeks. Okay. Trim off the dark green parts and use the light green stuff. Seems like a lot of wasted stuff, but the top is too fibery and stalky...those are not really words but they make sense. Not really what we're looking for in this dish today. Chop in half lengthwise and then slice thin like this. Are those pretty little leek-let-ribbon-lets? If I was crafting with those I'd hot glue them to some kind of wreath or something. Cooking today...focus. Focus. Push the vegetable to the side of the pan. Add the shrimp and cook until pink, about 3 minutes. Don't overcook the shrimp. I'm a nerd here, but honestly, I'm not a fan of rubber shrimp. If food bounces back when you chew it...you should spit it out. That's just my humble (yet highly accurate) opinion. Add the cooked pasta, and olives and lemon juice. Toss with the vegetables. 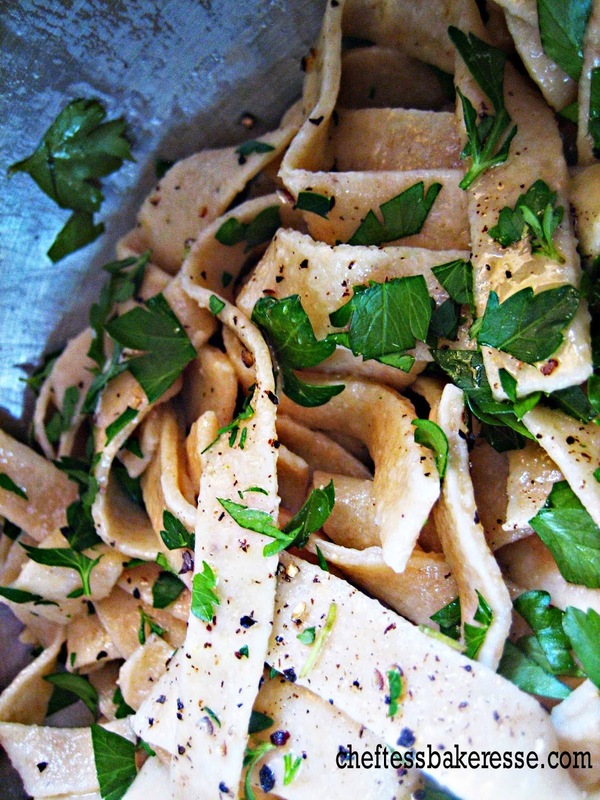 Seriously... if you still are buying pasta you need to see this: homemade-whole-grain-noodle-tutorial ! Season with pepper. Taste. Season as needed. Transfer to a serving platter or bowl. Garnish with chopped parsley and sprinkle with smoked paprika. Serve hot. Oh be still my fluttering magnificent heart! After I passed out...and came to...I realized I better take some pictures. You want to know something...I hid some. Confession. I did. I put some in a bowl at the back of the fridge so I could have some for later. Pasta salad the next day was even more magnificent...if that was humanly possible!